The Japanese Buddhist school of Shingon is something of an anomaly. It is a Mahayana school, but it is also a form of esoteric or tantric Buddhism and the only living Vajrayana school outside of Tibetan Buddhism. How did that happen? Tantric Buddhism originated in India. Tantra first reached Tibet in the 8th century, brought there by early teachers such as Padmasambhava. Tantric masters from India also were teaching in China in the 8th century, establishing a school called Mi-tsung, or "school of secrets." It was called this because many of its teachings were not committed to writing but could only be received directly from a teacher. Mi-tsung's doctrinal foundations are expounded in two sutras, the Mahâvairocana Sutra and the Vajrasekhara Sutra, both probably written in the 7th century. In 804 a Japanese monk named Kukai (774-835) got himself included in a diplomatic delegation that sailed to China. In the Tang Dynasty capital of Chang'an he met the renowned Mi-tsung teacher Hui-Guo (746-805). Hui-Guo was impressed by his foreign student and personally initiated Kukai into the many levels of the esoteric tradition. Mi-tsung did not survive in China, but its teachings live on in Japan. Kukai returned to Japan in 806 prepared to teach, although at first there wasn't much interest in his teaching. It was his skill as a calligrapher that earned the attention of the Japanese court and the Emperor Junna. The Emperor became Kukai's patron and also named Kukai's school Shingon, from the Chinese word zhenyan, or "mantra." In Japan Shingon is also called Mikkyo, a name sometimes translated as "secret teachings." Among his several other accomplishments, Kukai established the Mount Kyoa monastery in 816. Kukai also collected and systematized the theoretical basis of Shingon in a number of texts, including a trilogy called The Principles of Attaining Enlightenment in this Existence (Sokushin-jobutsu-gi), The Principles of Sound, Meaning and Reality (Shoji-jisso-gi) and The Principles of the Mantric Syllable (Unji-gi). The Shingon school today is subdivided in many "styles," most of which are associated with a particular temple or teacher lineage. Shingon remains one of the more prominent schools of Japanese Buddhism, although it is less well known in the West. Tantric Buddhism is a means to realize enlightenment by experiencing oneself as an enlightened being. The experience is enabled through esoteric practices involving meditation, visualization, chanting and ritual. 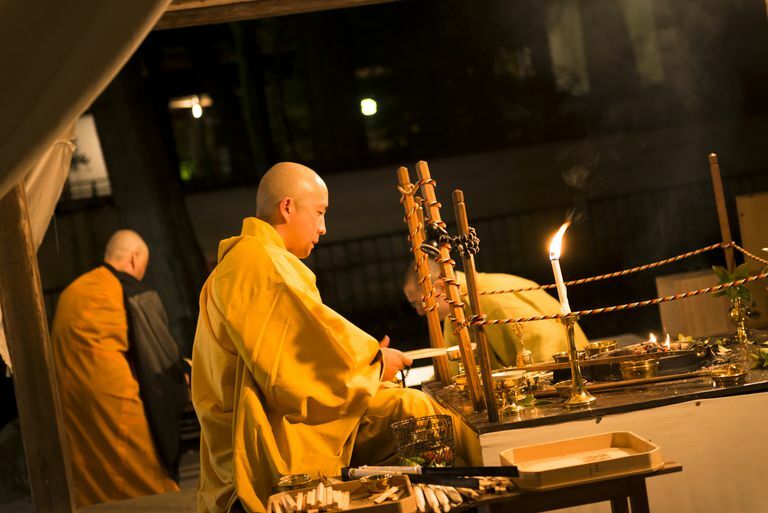 In Shingon, practices engage body, speech and mind to help the student experience Buddha-nature. Shingon teaches that the pure truth cannot be expressed in words but only through art. Mandalas -- sacred "maps" of the cosmos -- are especially important in Shingon, two in particular. One is the garbhadhatu ("womb") mandala, which represents the matrix of existence from which all phenomena manifest. Vairocana, the universal Buddha, sits in the center on a red lotus throne. The other mandala is the vajradhatu, or diamond mandala, which portrays the Five Dhyani Buddhas, with Vairocana at the center. This mandala represents Vairocana's wisdom and realization of enlightenment. Kukai taught that Vairocana emanates all of reality from his own being, and that nature itself is an expression of Vairocana's teaching in the world. The initiating ritual for a new practitioner involves dropping a flower onto the vajradhatu mandala. The position of the flower on the mandala indicates which transcendent buddha or bodhisattva is empowering the student. Through rituals engaging body, speech, and mind, the student visualizes and connects to his empowering enlightened being, eventually experiencing the enlightened being as his own self.